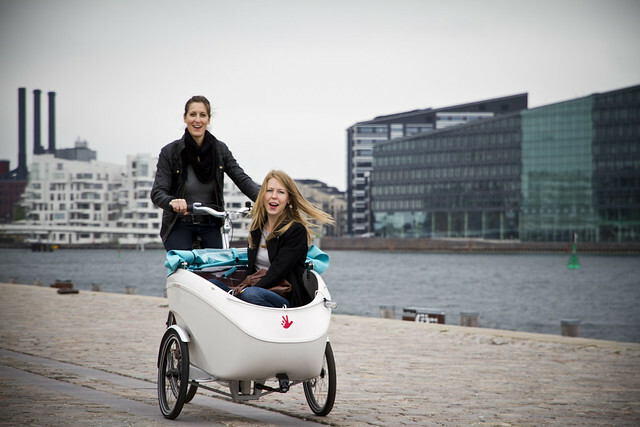 Two good friends on a Triobike Mono cargo bike. was this a commercial photo shoot? Aaaanyway... so the whole Triobike concept was so poorly executed the first time around, they had to make one that's not even convertible? What's the thinking behind that? Why did they not even try to improve the glaring flaws for everyday use by not-dedicated-cyclists, such as no chain cover, no skirtguard, disk brakes, no lights, sporty saddle? How long is that box going to look immaculate? How do the kids get in and out? Did they think they were making the 3-wheeler equivalent of a Bullitt? It looks like a disposable toy for yuppies, again.